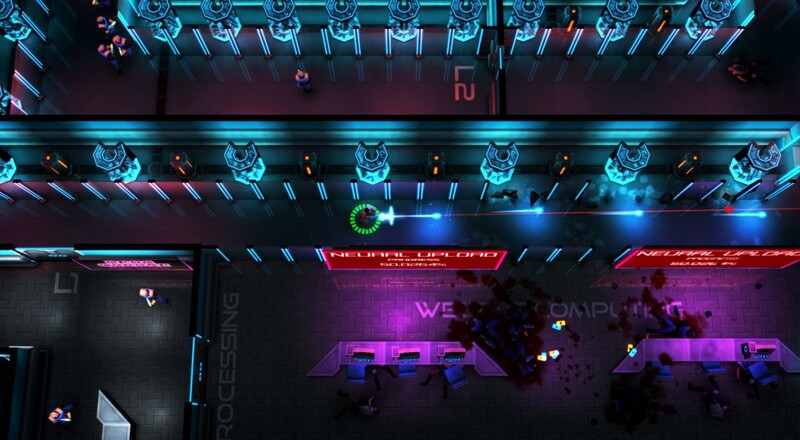 The cyberpunk themed, top-down shooter Neon Chrome sees its console debut today. Before diving into the dystopic future that awaits us all, check out the hot tips from Sampo Töyssy, the title's lead designer and distinguished gentlemen we interviewed for the post-mortem, on the PlayStation blog, which should help you bring down the Overseer. Based on my time with the game so far, I definitely agree with points two and three on Sampo's list (unlock upgrades and install enhancements before each run). The game is a little bit different kind of difficulty compared to other twin-stick shooters. Engaging in firefights with a group of enemies is a quick way to get yourself killed. You're usually better off surprising them and picking a couple off before they can even shoot at you, or using the environment to block their fire so you can gain some distance and take on just a couple at a time. Our full co-op review should go up later this week. Neon Chrome supports up to four players locally throughout the campaign, though progress (such as unlocked weapons, enhancements, upgrades) is only saved for the first player. Page created in 1.2430 seconds.